In the 1980s and sometime beyond, North American gamers were largely in the dark about the various roleplaying games franchises that originated in Japan, such as Final Fantasy and Dragon Quest, with U.S. players lucky if they even got certain entries in those particular franchises, albeit with cut content due to American videogame censorship regarding things such as religious themes, mature content, and coarse language. Among the franchises whose initial installments remain in Japan to this day was Atlus’s Megami Tensei (colloquially MegaTen) pantheon, early entries published by Namco’s Japanese branch. It would take a few console generations for North American gamers to receive introduction to the franchise with spinoff titles such as Revelations: Persona, during a time when videogame localizations were still largely unrefined. 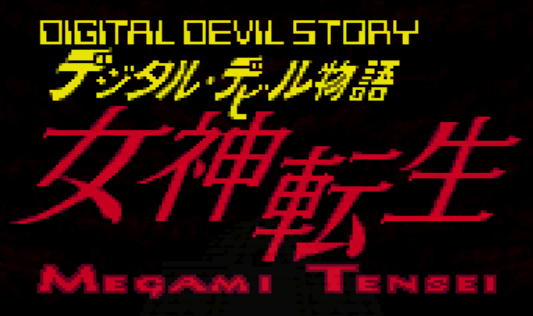 A compilation of remake of the very first two games released in the franchise in Japan, titled Kyuuyaku Megami Tensei (“Goddess Metempsychosis: The Old Testament), was also overlooked for localization, the first entry in the collection, Digital Devil Story: Megami Tensei, actually proving an important title in the history of roleplaying games. The in-game story is simplistic, focusing on a genius computer programmer named Akemi Nakajima who develops a computer program to summon demons, although it spirals out of control, necessitating that he and his female companion, Yumiko Shirasagi, visit the demon world to combat Lucifer and his generals. MegaTen doesn’t seem to have any more story than its original Famicom incarnation had, given the lack of further development and backstory throughout the game, even towards the end, the concluding cutscenes being brief, inexcusable given the game’s basis on a series of novels. That leaves the gameplay to fill the void left by the plotline, and fortunately, MegaTen does fairly well in this regard, its original version in its time the pioneer of the monster-collecting subgenre of roleplaying games, predating the likes of Dragon Quest V and Pokémon. When starting a new game, the player assigns bonus stats to Nakajima and Yumiko, with this reviewer able to advice players not to give the former any extra intelligence given his complete lack of MP-consuming abilities, after which the player begins in the top floor of the initial first-person dungeon, Daedalus, where they can buy equipment, save the game, and fuse demons once they’ve gotten at least two to do so. When ready, the player can head into the floors below, randomly encountering battles (with the rate of encounters seeming especially high whenever passing through doorways) consisting of one or more enemies of the same type. Before fighting, the player can negotiate with the monsters for possible recruitment, the system of doing so being somewhat simpler than in future MegaTen titles, although most foes are somewhat uncooperative in this regard, mostly due to not speaking Nakajima and Yumiko’s language or inviting them to draw near, in which case they always take the two by surprise. If negotiations start successfully, the player can “soothe” the enemy by smiling, putting away their weapons, or approaching the enemy, and if they succeed, they can bribe the foes with money or healing jewels to get them to join, although they may bail out at the last minute, wasting the player’s investment into negotiation. When the player does get an enemy to join, they can summon it with Nakajima’s COMP at the cost of Macca, the game’s currency, and navigating the many labyrinths with summoned demons requires Magnetite, gained from killing enemies impervious to negotiation, with none of this material in stock meaning that active demons will take HP damage with steps taken. As such, Megami Tensei somewhat suffers from early-game hell in this regard, although towards the end when fused demons have high HP, not having any Magnetite isn’t a terrible burden, and early on, the two human protagonists can somewhat handle fights on their own, with the autobattle feature making fights a breeze. Should both heroes die, the player takes a voyage on the River Styx, where Charon offers to revive them at the cost of half their money, and if demons joined them in death, the player must pay healers to resurrect them, again accounting for more potential early-game tedium, although these costs are largely inconsequential in the endgame. Nakajima can carry up to seven demons in his COMP at any time and summon up to four into battle, accounting for a total party size of six characters, and can fuse them at Cathedrals of Shadow into more powerful incarnations, symbols fortunately indicating which combinations will produce more powerful demons, Nakajima needing to be at least at the same level as a fused demon in order to create it in the first place. Overall, aside from the bit of early-game hell and occasional annoying enemies that can cost either human protagonist experience levels (from which this reviewer simply ran), the gameplay definitely serves the first MegaTen title well, and was ahead of its time in the Famicom era. Control, however, doesn’t fare as well, given a vague sense of direction at times that may necessitate the player to revisit certain areas in the game’s massive interconnected dungeons that the in-game maps, while somewhat useful, don’t clearly indicate, and revisiting older locations can be a burden, with the sky city of Bien able to convey players among three points, but isn’t foolproof transportation. There’s also no indication when shopping for new equipment with how prospective gear will raise or lower current stats, and the equipment screens don’t show attack and defense power. Ultimately, the developers could have certainly rectified these issues. Perhaps the high point of Megami Tensei is its soundtrack, with just about every piece being good, different areas having varied themes, notable tracks including that which plays in the first dungeon, Daedalus, although the sound effects are limited. The graphics are decent as well, though to a lesser extent, with nice first-person dungeon and enemy designs, although the player never gets to see the playable protagonists, and there are occasional palette-swapped antagonists. Playing time is indeterminate due to the lack of a game clock, and there’s little reason to replay the game given the lack of sidequests or things to pad playtime other than leveling. To conclude, the original Megami Tensei was definitely ahead of its time, being the pioneer of the monster-collecting roleplaying game subgenre, its take on this mechanic being generally solid in spite of early-game hell, alongside nice music to accompany the player’s experience. Being a remake of an early game in its genre, however, it does have issues regarding things such as the difficulty without using a guide, the minimalist storytelling, the strict first-person nature of the visuals, and lack of reasons to replay. The game is by no means a masterpiece, although it definitely stands as one of the most important RPGs in the history of the genre that warrants a look. +Solid demon negotiation and fusion systems. An important game in the history of RPGs.